Located in Douglas County, Colorado, Castle Rock is one of the most prominent and distinctive towns in Colorado. Located in the famed Front Range Urban Corridor, Castle Rock is not technically a suburb of Denver, but it is located roughly 10 miles south of the city and nearly 40 miles north of Colorado Springs. This town of just over 48,000 live in a city named after a very distinctive castle-tower shaped butte that is located near the center of the town. Castle Rock has a unique history that stretches back well into the 19thcentury, yet is vibrant with new growth that has been spurred by the advancement of technology. Founded in 1874, Castle Rocks is the county seat of Douglas County, Colorado thanks to its central location. Originally the home to the Arapahoe and Cheyenne tribes, settlers moved into the area during the Civil War thanks to the Homestead Act of 1862 and the rumors of gold in the region. However, it was the discovery of rhyolite stone that led to the settlement of Castle Rock. The city began as a small mining community and was centered near the unique rock formation that became the center of the town. A train depot helped further the community’s development in the 19thcentury, bringing more people into an area that now covers 35 square miles. 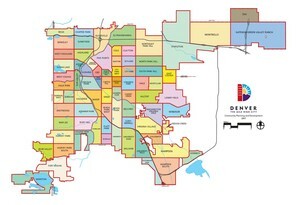 Although built up as a mining community, today Castle Rock’s main employer is the Denver Technology Center or DTC which is located just north of the city. Castle Rock however features a diversity of small businesses and thriving shopping and retail centers. The neighborhoods range from the smaller, old fashioned homes that were built in the 19th century to modern housing and neighborhoods that have become quite prominent in this historic area. Castle Rock has many striking outdoor features and the unique countryside provides the town with a distinguished layout that is different than most communities in Colorado. Built along the northern edge of the Castle Rock community, Castle Pines is a small town of less than 4,000 people. On November 6th, 2007, Castle Pines was incorporated into the Castle Rock township. Castle Pines features a number of distinctive homes and neighborhoods that have benefitted from the growth of the surrounding cities and towns along the Front Range Urban Corridor. The name Castle Pines may best be known in the US as the former site of a USGA professional golf tournament at the Castle Pines Golf Club that ran every year from 1986 to 2006. As with Castle Pines, the countryside is rugged, semi-desert type conditions that feature rock outcroppings, canyons, steephillsides, mesas and plateaus. The rugged countryside along with the higher elevation has drawn in tourists to the area and is one of the more scenic sites in Colorado, standing in sharp contrast to the snow capped Rocky Mountains which can be seen in the great distance. Both Castle Rock and Castle Pines are unique communities in the Denver Area. Featuring rugged terrain and a long history, both communities rely on the advancement of modern technology to fuel their economies.